We are at the beginning of another year. There are several changes this year you should be made aware of. To begin, there will be new documentation required on all of the refundable credits. Please call us to determine what additional information is required. In addition, all returns with these credits that result in refunds will be delayed until February 15th, 2017. There have been some changes in the due dates for some tax returns this year. S-Corp (1120S) and Partnership (1065) returns are now both due March 15th while C-Corp (1120) and personal returns are due April 15th. Extended C-Corp returns will be due October 15th. This change is new for this year and should be helpful for many. We are comfortably set in our new office. The address is 2500 S. Power Rd. Suite #113, Mesa, AZ 85209. We welcome any early appointments. 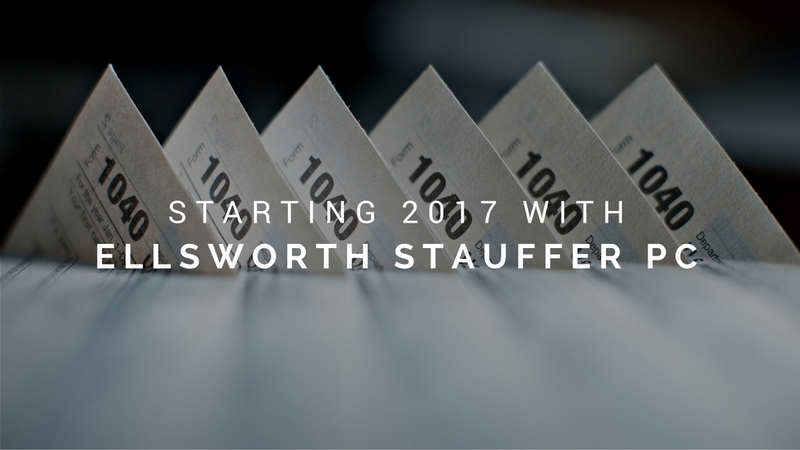 Additionally, as you may have seen, we have changed our name to Ellsworth Stauffer PC. While we have changed to a new name, our operations and staff have remained the same. Additionally, in the coming weeks we will have new e-mail addresses which are included below. Please continue using the current email addresses for the remainder of January. We will also be launching our new website, www.es-tax.com where we will have many helpful links and downloadable resources. Please email or call us with any questions. We look forward to seeing you soon.